"The Lost Outpost" is sanctioned for use in Pathfinder Society Organized Play. The rules for running this Adventure Path and Chronicle sheet are available as a free download (702 kb zip/PDF). 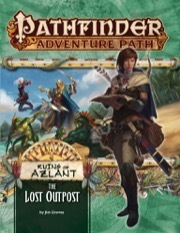 When I first saw that Paizo was releasing an adventure path revolving around Azlant, I suddenly felt a little like a kid on Christmas Eve. I downloaded the PDF the morning it came out and read as much as I could before having to leave for work. We are now 3/4 through the book and having a blast! A big thank you to everyone at Paizo for all the work put into this. We are eagerly looking forward to the rest of the adventure. 1) A large list of NPCs that have pre-generated backgrounds for use in the campaign at your discretion. 3) Developers / writers went the extra mile to enhance player immersion while on the island. 4) Not everything is hack-n-slash, writing is supportive for multiple outcomes. 5) The section on Aboleths is one of the largest/best I've seen since an old Dragon magazine from way back. 1) The last map needs a bit more dressing. 2) Some of the unused NPCs do not show information for their class/race/alignment/ ect. This may be done purposefully so the GM can flavor however they want but a suggestion on what to use would have been good. In closing, despite the cons I listed, we are really enjoying the adventure so far. As a GM running the adventure for 5 players, I've found it to be decently paced and a pleasure to run. 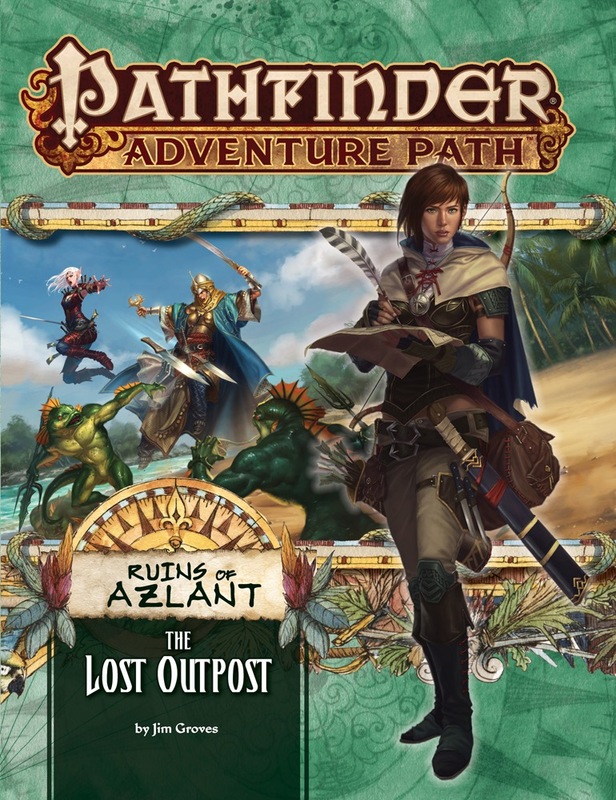 I was super excited to get Ruins of Azlant, and there is a lot to like about this first installment. There is a lot of discovery going on in Part 1, instead of it being just a way to get out of level 1. There is an interesting cast of NPCs for the party to get involved with, and I feel like it's a more manageable number than in Skull & Shackles, with some great scripted interactions. So why only 3.5 stars? First of all, the AP suffers from lack of battle maps. The entire first part of the AP has one non-grid-lined map and nothing to cover the combats. It would have been helpful to at least have suggestions of Flip Mats and Map Packs to use instead. As it is, I'm probably going to be cannibalizing from a lot of them and being like, "I know it's not the same shape as it was on the outside. Just go with it." Since I run online, I may also just super enlarge the big map. The second issue is that I feel like a certain point in the AP doesn't give appropriate guidance as to why the PCs would go to a particular place. Everything for the first two parts has a logical motivation, but then it becomes a description of places where the PCs need to go without any impetus for that particular place. Yes, I can make something up, but the lack of a quest-give in this place feels like an oversight. Huh, interesting premise. Very intrigued by the aboleth section. Cool, it starts out like the lost colony. I am already interested in this one. Odd, the mention of aboleths dissipated any interest I had in this AP. Yay! I'm super happy to see this on the site! Cannot WAIT to run this one! Now I'll finally have information on what my players find when they sail too far west. Looking forward to this AP! I petition for an "Aboleth" miniature to be among the HUGE ones we´ll (probably) get late in 2017 in "Pathfinder Battles". "And where the colony was supposed to be there was nothing, save a single word carved into a tree. CROATOA!" I just like the ecology section on Aboleth, especially if it means more than just two or three kinds. Wouldn't that be more Arcadia? I was thinking that Sun Temple colony, myself. This takes place in a region of ruined Azlant a few hundred miles south of the Sun Temple Colony. Ah, the Sun Temple Colony. That was probably my favorite section of Lost Cities of Golarion. I'm kinda curious, why some people lose their interest instantly upon hearing word "aboleth"? Were those over used back in D&D days? .-. Aboleths are great in terms of the history and flavour of Golarion. My main objection to them is that with their abilities, quite over powered for their CR, they make terrible villains. Either the party expects the aboleth, prepares appropriately, and it becomes effectively useless in combat or they don't and PCs will probably end up dying with no chance to resist. In terms of stat blocks I consider them one of the worst monsters in all the bestiaries. Can't say I want to go anywhere near an adventure where it looks like there's a good chance an aboleth will be a major if not the major villain of the adventure. Unless of course the authors are clever enough to find a way to have an aboleth themed adventure where PCs never actually meet an aboleth. Well, it's an adventure about Azlant. Of course there would be Aboleths. They are the main nemesis of the continent and it's people. Well, I'm excited to read about their ecology and society - as there are more than one variation of the alghollthu (thanks Kalindlara). Maybe we are even getting a lesser variation of the aboleth in the bestiary section. It will be interesting to find out more about the aboleth and the colonist in the area as well. For me, it's a general allergy to Lovecraftian concepts. When they show up in APs and can be reskinned or written out, it's easier to deal with than when the Lovecraftian elements are fundamental to the AP's plot. Just for the record, aboleths are not Lovecraftian. Different types of critters with different types of motivations. Aboleth, one of my favorite monster in AD&D 1st ed. I especially liked the Ecology of the Aboleth (and the 4 new variants provided) in Dragon 131 and the saltwater variant in Dungeon 12. Well, has something changed since James Jacobs wrote things in this thread? The aboleth chapter in Lords of Madness remains some of my favorite writing for D&D to this day. I really REALLY enjoyed writing about them, and the fact that they're Lovecraftian won't be changing in Golarion. Our aboleths won't be exactly the same as the ones in LoM, but they'll be pretty similar. And while they won't be tied to the Elder Evils listed in that book... we can go one better in Golarion and actually tie them to Great Old Ones and Outer Gods like Nyarlathotep, Yog-Sothoth, and Azathoth. So in a way... Golarion's aboleths are going to be even MORE saturated with the Cthulhu Mythos. edit: just for the record, I'm not trying to be antagonistic, it's just that I'm very surprised to read that what I used to think about them suddenly wouldn't be true anymore. As it happens, the message you quote is almost a decade old. A lot has changed in the past 8 years or so. Most significantly, the fact that today, we've wholly welcomed actual Lovecraftian elements into the setting, something that, in 2008, we were super timid about doing. And the fact that what I did for them in Lords of Madness really did have some faux Lovecraft going on makes it even more compelling to us here at Paizo for our aboleths to do something different. In my view, that difference is that aboleths are fundamentally incapable of understanding the concept of faith. That's part of what makes them aberrations; their minds are aberrant to the human mind in that faith doesn't compute to them. That inability to have faith makes them poor choices for things that worship things, including Outer Gods and Great Old Ones. In any event... I wouldn't qualify a change in focus over 8 years as "sudden" at all. Interesting to follow up Strange Aeons with more Lovecraftianish but not totally Lovecraftian content. EDIT: Ah, with that quote being so old, it's very possible and likely that any Lovecraftian elements will be somewhat quietly in the background of any aboleth's in this AP. *doesn't expect Aboleths to follow any gods if they don't want to* Even the Great Old Ones or Outer Gods. They can do for themselves. Any chance we will get a new type of aboleth each volume? I'm quoting James' post because I want to build on what he's said and the point he's made. First I want to say that since Strange Aeons was the big all-in Lovecraftian Adventure Path, it would be irresponsible of us to do another Lovecraftian AP just six months later (unless they were related in some tight way, which they're not). While at one point aboleths were stand ins for Lovecraftian elements, they've grown in the lore of Golarion over the years. We have more than just the basic aboleth and have introduced the "family" of alghollthu. The introduction of veiled masters and omnipaths and other associated minions and servitor races, I feel, has significantly shifted the alghollthu into their own thing. And, since they've always had an issue with divinities and faith, like James said, the connection to Great Old Ones and Elder Gods makes them not Lovecraftian at all. Now... I can totally see that if what someone means by Lovecraftian they are talking about weird horror/cosmic horror rather than adhering to the Mythos, well you got me there. Alghollthu are weird monsters that are cold, calculating, and don't quite care for humanity. I kinda always thought that aboleths were lovecraftian-ish(just because of psychic tentacle fish) secret illuminati conspiracy "they built your civilization and now they are among you" thing rather than cosmic horror .-. I did mean that more as related to my perception, didn't want to imply anything other than that. Apart from that, I have no problems with this shift, though I like me some Lovecraft. But I have to admit that everything that has Aberration written over it directly connects to Lovecraft in my mind, even when they have another origin :), I'm certainly not as much into the details of the Mythos as you are, so again it's just my perception of things that probably combined with what you said years ago in a wrong way. First I want to say that since Strange Aeons was the big all-in Lovecraftian Adventure Path, it would be irresponsible of us to do another Lovecraftian AP just six months later. I couldn't disagree more with that :D (just kidding, of course), there might still be minds to shatter. Will there be any type/subtype of creature that will get a new type each volume? I'm confused why some people are apparently surprised about aboleths being in an AP connected with Azlant, given the fact the aboleths have been connected with Azlant from the start. For me, it's a general allergy to Lovecraftian concepts. A general allergy to tentacled deepwater corrupting mind-affecting horrors with links to outer space and ideas about racial perfection, slavery, eugenics, and genocide that are similar to Lovecraft's, then. To build on Adam's post just above mine, I worked on both adventure paths, so I feel that I have some perspective. They're fairly different. Yeah, I can understand how people relate the alghollthu to something Lovecraft might have created, but the tone and vibe are different. To me, "Lovecraftian" means more than just some monster with tentacles that lives in the water. It's psychological and often draws on elements of altered perceptions. This specific chapter reminds me of tv show, Lost, more than it does say—John Carpenter's In The Mouth of Madness. That feels like the apples and oranges comparison you guys might be trying to force. That said, aboleths are aboleths. The Lost Outpost has elements of mystery and suspense, which builds and deepens with the subsequent chapters. I think people will be pleased to hear that the authors worked closely together under Adam's leadership to pull the entire story together into a cohesive epic with as much continuity as we could manage. I'm every bit as excited for the other chapters as I am for my own. Hell yeah, and I get the need to address them; it's no surprise. I'll still probably be in for some of the PDFs. It just won't likely make it to the table. Yeah, I can understand how people relate the alghollthu to something Lovecraft might have created, but the tone and vibe are different. I understand what the differences are, but they're clearly thematically inspired and similar enough that my players start to tune out. They did during Hell's Rebels, the last Paizo AP we ran, when it became clear they'd have to deal with Menotheguro. I ended up reskinning him as an encantado to dodge another "why always tentacled alien aberrations" revolt as what happened when we hit Valley of the Brain Collectors. Even if I get the nuance, it doesn't matter if the table doesn't, or does get it but rejects them anyway because of the non-superficial shared elements. It doesn't help that I also feel permanently burned out on the shared superficial elements from how culturally saturated they've become. I didn't expect what I thought was my own answer to a straightforward and subjective question to blow up half this much, so I'll walk off here as well. It's my opinion, I know folks who share it, I know other folks don't share it, I don't want to convince anyone to share my opinion, I hope people have fun with it, and I look forward to the lore contributions. Even if aboleth are not classified as mythos creatures, they were more then likely inspired by such things back when they were original created. I didn't mean any offense. It probably feels like strangers on the internet are telling you that you're wrong and that you don't know what you're talking about. I'm sorry. They can easily fit into Lovecraftian themes with almost no effort. You're not crazy. We just didn't try to double down on that, so that we are oversaturating folks on Mythos. Hopefully we succeeded and hope you'll take a peek. To check how well we did. Best wishes and please know your opinion is respected, and no disrespect or patronizing was intended. Again, I am going to defer to Adam. I just wanted to say this. Thanks for the lost colony adventure.